Jupiter is the largest planet in our solar system and it is the fifth planet from the Sun. It is well known for its size and also the brightly coloured bands of cloud that contain different weather features on the planet including the famous Great Red Spot. 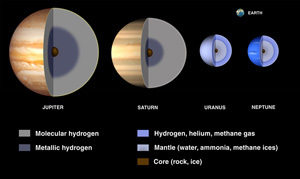 It is the first of four large gas planets, the others being Saturn, Uranus and Neptune. 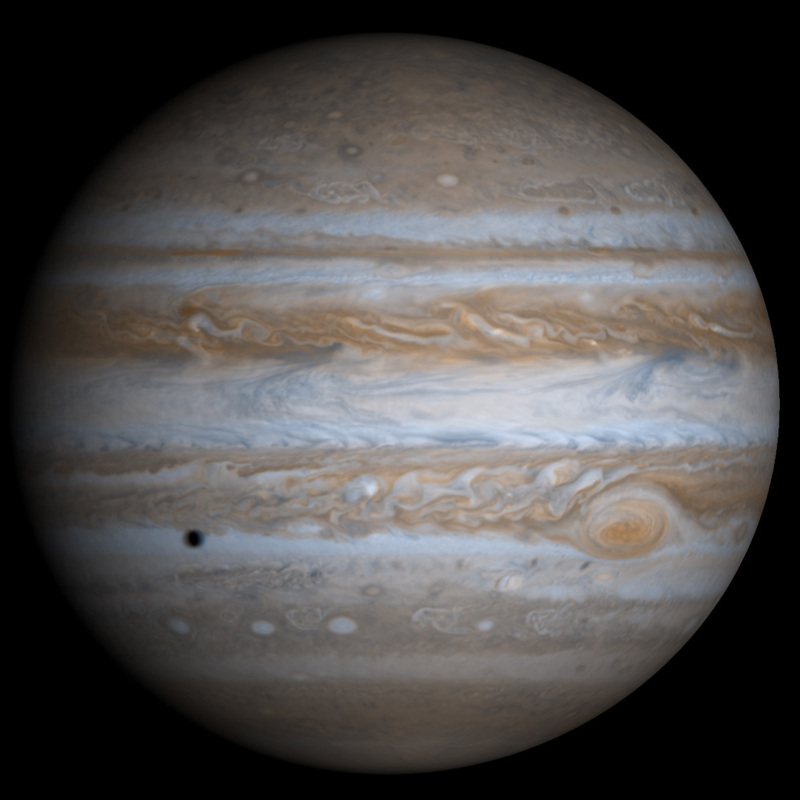 Jupiter does not have a solid surface due to its gaseous make up although it does have a probable rocky core. This does not mean that we would be able to inhabit the planet though because the pressure on the surface would make habitation for life forms as we know them impossible. Not to mention the fact that wind speeds can reach 400mph Jupiter is named after the Roman god Jupiter who is known as Zeus in Greek mythology. Here are some more facts about Jupiter. Jupiter has at least 63 different moons – most of them are less than 10 kilometres in diameter and are thought to be captured asteroids. The exception is the four “Galilean” moons (named after their discoverer Galileo Galilei in January 1610). These are Io, Europa, Ganymede and Callisto. Jupiter is fifth planet away from the Sun at a distance of 780 million kilometres and it is the first of the “gas giant” planets. Jupiter is the largest planet in our solar system with a diameter of 142,983 kilometres. This diameter is 11.19 times the size of the Earth’s which means you could fit 1300 Earth’s inside it. Jupiter’s atmosphere is made up of approximately 75% hydrogen and 24% helium, with trace elements of ammonia, carbon, ethane, hydrogen sulphide, methane, neon, oxygen, phosphine, silicon-based compounds, sulphur and water vapour. Jupiter’s mass is 320 times that of the Earth and 2.5 times the mass of every other planet in our solar system combined. 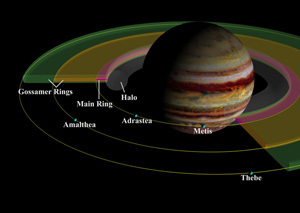 Jupiter has planetary rings. These are very faint and consist of three main segments, the halo, a fairly bright main ring, and an outer gossamer ring. 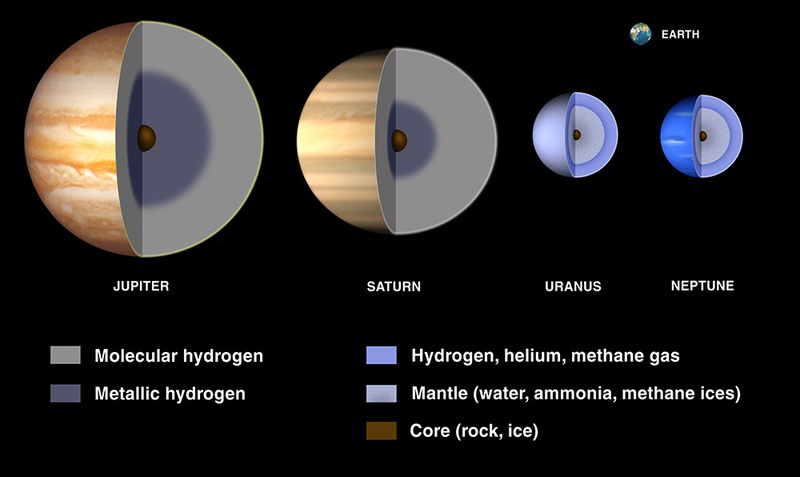 None of the rings are thought to contain ice as is the case with Saturn. Jupiter’s rings are thought to be made of dust particles. Jupiter rotates faster than any other planet in the solar system despite its massive size. It makes a full rotation on its axis every 9 hours 50 minutes and 30 seconds. Jupiter orbits the Sun once every 4332.71 Earth days. This amounts to an orbit every 11.86 years. On average Jupiter is the third brightest object in the night sky after the Moon and Venus. The Giant Red Spot is a massive storm in the atmosphere of Jupiter that is known to have been raging since it was first observed by telescope in the 17th century. It rotates anti-clockwise and is larger than the diameter of the Earth. The different colours in the atmosphere of Jupiter are created because of the different number of chemicals and temperatures present. The light coloured bands are called zones and the dark coloured bands are called belts. Jupiter receives more impacts from Comets than any other planet in the solar system. Jupiter was first visited by the US Pioneer 10 spacecraft in 1973. Later visits were made by Pioneer 11, Voyager 1, Voyager 2Ulysses, Cassini and New Horizons. There is a strong magnetic field on Jupiter. You would weigh 2.5 times heavier on Jupiter than you would on the Earth.